This guest post is by Paris based Julian Bowyer: A friend, fellow traveler and superman behind the stove. He is currently eating his way through the streets of Vietnam. 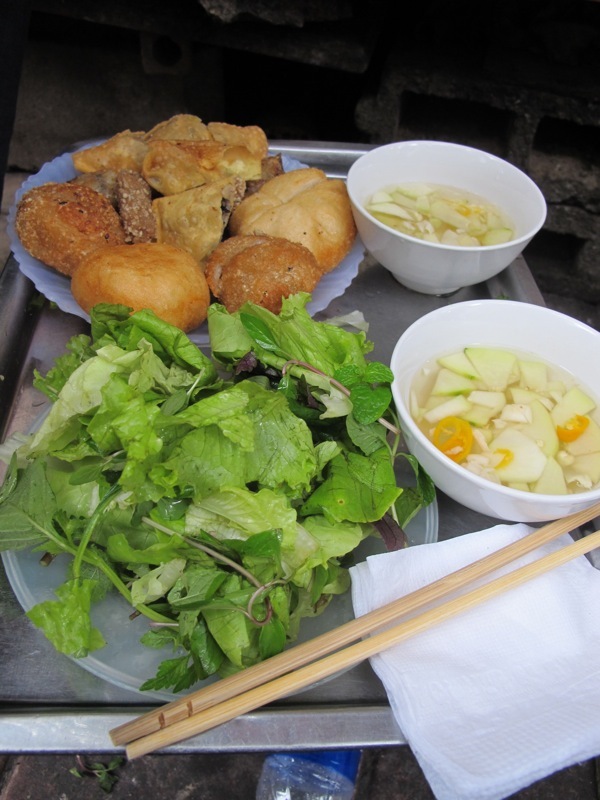 Here is his report from this morning's breakfast in Hanoi! 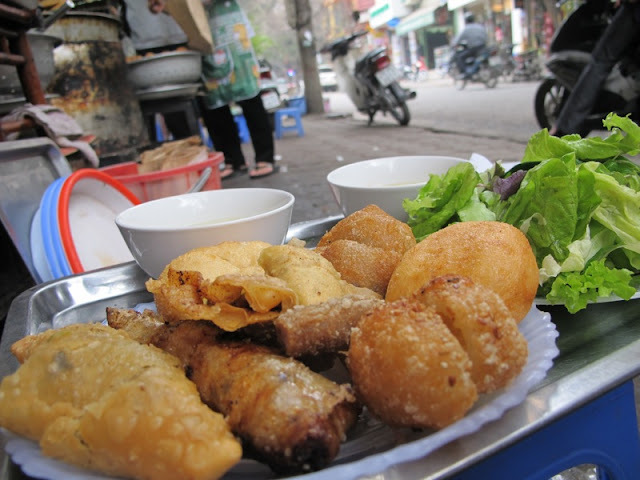 Bánh is the Vietnamese word for dumpling and while visiting the St Joseph cathedral in the old town part of Hanoi we came across a Bahn street stall called Ly Quoc Su and decided to stop for breakfast. Young Vietnamese girls with nimble fingers, filled different types of dough and pastry with all manner of tasty fillings, passing them over to their mothers and aunts, whose steady well worn hands plunged the delicate morsels into a vehemently hot, charcoal fuelled, cauldron of oil. Looking around for a place to sit we saw how popular the Bánh stall was, tables full, and a queue of locals waiting for takeaway orders. On instruction from the fiercest of the cauldron guardians we grabbed some plastic stools to create our own makeshift table, ordered 2 of each shape and got stuck in. The fillings were fresh and tasty; minced pork and prawns were paired with black mushrooms, vermicelli noodles, yellow beans, water chestnuts and bamboo shoots. Crunchy, juicy, porky, prawny, breakfasty heaven. There was a lighter than usual sweet vinegar with some sliced yellow chillies bobbing around and a few wafers of green mango to cleanse the pallet. On the side, a guilt appeasing serving of salad greens and Vietnamese herbs. 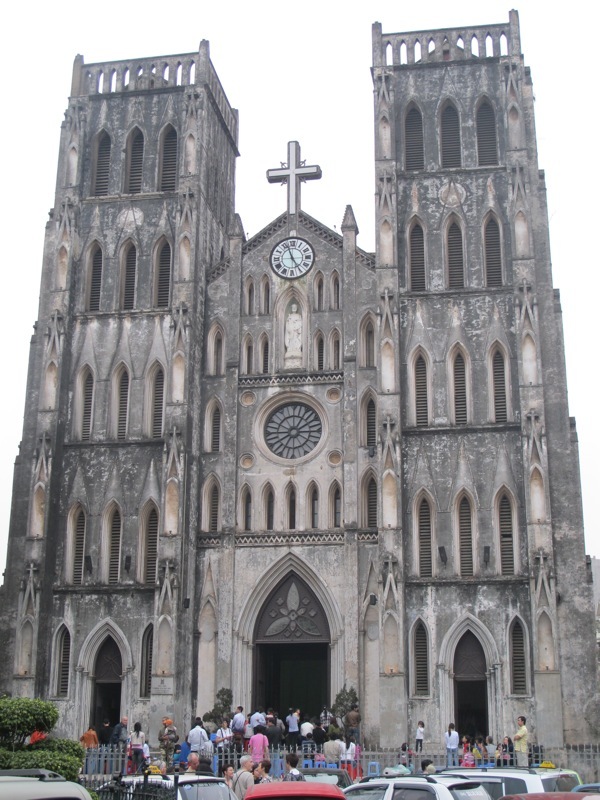 If the salad isn't enough to absolve you, at least the Saint Joseph Cathedral is close-by where you can confess your sins of a deep fried breakfast to tempt even the most saintly. It's bánh not bahn. 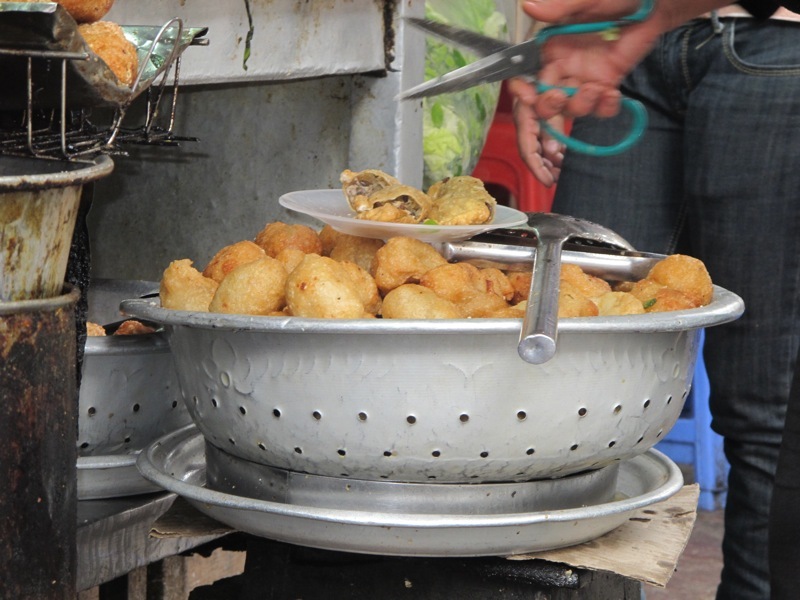 Also bánh does not just mean dumpling--it's a general word for pastry/biscuit/baked/steamed/deep fried goodness. Great post and pics. Scrumptious! Thanks for the correction Ben. Noted!